The £2.5m failure of Noel Edmonds' Blobby theme park has been blamed on council officials. A report into the collapse of the attraction, founded by TV presenter Noel Edmonds' company, Unique, said Lancaster City Council failed to protect the interests of local tax payers. And it described council decisions relating to the Crinkley Bottom Theme Park as "as imprudent, irrational and even unlawful". The report, from the district auditor, singled out two employees - former town clerk Bill Pearson and ex-city treasurer David Corker - as being particularly to blame for the fiasco. It said "significant responsibility" rested with Mr Pearson, with a share of the blame going to Mr Corker. 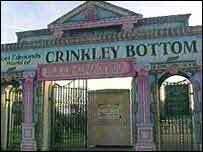 The Crinkley Bottom Theme Park opened in Morecambe in the summer of 1994. It closed 13 weeks later because of disappointing visitor numbers and the ensuing legal battle and administration cost the council £2.5m. The council tried to sue Noel Edmonds' company Unique for breach of contract but eventually paid out £950,000 in an-out-of-court settlement. In the final report, district auditor Clive Portman accused the council of failing to protect local people's interests at every stage of the project. He said the decision to enter into an agreement with Unique, was "imprudent". And he added an agreement signed later by the council which meant they took on the entire financial risk for the project was "irrational and unlawful". He concluded that the council's termination of their deal with Unique was "a mistaken and costly decision." Council leader Ian Barker has welcomed the report saying he hoped a line could now be drawn under the whole affair. He said: "I think Morecambe became briefly a laughing stock because of it, but I think it got over that. But he admitted: "It has been a running sore in the reputation of the council for a very long time - I think those wounds are now healing. "And I think with the publication of this report, if it's accepted, and after the lessons are learnt, I think at long last we can start to put Blobby behind us." It has been a running sore in the reputation of the council for a very long time.